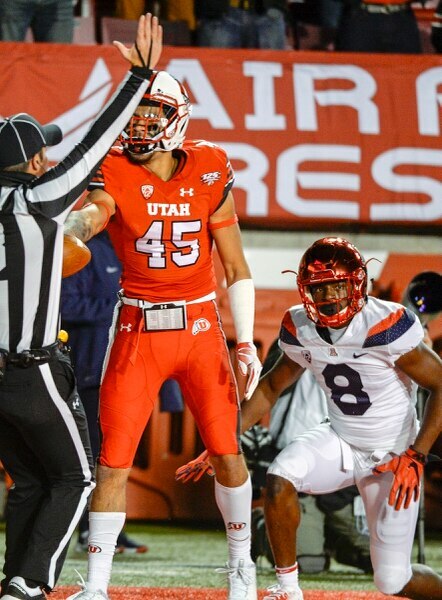 Utes need a homecoming victory to tie USC in the Pac-12 South standings. While the Utah Utes rested Saturday, the rest of their schedule became more demanding. That's especially true in the case of their next opponent. USC statistically dominated Colorado in a 31-20 victory, leading into the Trojans' visit to Rice-Eccles Stadium for Utah's homecoming game Saturday. Of the remaining teams on Utah’s schedule, only Colorado lost this past weekend. USC, UCLA, Oregon and BYU won, and Arizona State was idle. The Utes (4-2, 2-2 Pac-12) enjoyed an extra day’s break after Friday’s 42-10 win over Arizona, bringing them to the halfway point of their season. The second half starts with a potential championship game in the Pac-12 South. That phrase also may apply to Utah’s contest at Colorado in November, or so the Utes hope. Leah Hogsten | The Salt Lake Tribune Utes linebacker Chase Hansen (22) and Utes defensive back Marquise Blair (13) looks to tackle Arizona Wildcats quarterback Jamarye Joiner (10)as the University of Utah hosts the Arizona Wildcats at Rice-Eccles Stadium in Salt Lake City, Friday Oct. 12, 2018. Leah Hogsten | The Salt Lake Tribune Utes wide receiver Samson Nacua (45) with the touchdown as the University of Utah hosts the Arizona Wildcats at Rice-Eccles Stadium in Salt Lake City, Friday Oct. 12, 2018. Utah leads 28-0. Leah Hogsten | The Salt Lake Tribune Utes defensive end Maxs Tupai (92) tackles Arizona Wildcats running back Gary Brightwell as the University of Utah hosts the Arizona Wildcats at Rice-Eccles Stadium in Salt Lake City, Friday Oct. 12, 2018. Utah leads 28-0. Leah Hogsten | The Salt Lake Tribune Utes wide receiver Demari Simpkins (7) pulls down the touchdown pass as the University of Utah hosts the Arizona Wildcats at Rice-Eccles Stadium in Salt Lake City, Friday Oct. 12, 2018. Utah leads 28-0. Leah Hogsten | The Salt Lake Tribune Utes wide receiver Samson Nacua (45) celebrates his touchdown with Utes defensive end Caleb Repp (47) as the University of Utah hosts the Arizona Wildcats at Rice-Eccles Stadium in Salt Lake City, Friday Oct. 12, 2018. Utah leads 28-0. Leah Hogsten | The Salt Lake Tribune Utes wide receiver Samson Nacua (45) celebrates his touchdown with Utes tight end Brant Kuithe (80) and Utes offensive lineman Orlando Umana (50) as the University of Utah hosts the Arizona Wildcats at Rice-Eccles Stadium in Salt Lake City, Friday Oct. 12, 2018. Utah leads 28-0. Leah Hogsten | The Salt Lake Tribune Utes running back Zack Moss (2) with the touchdown as the University of Utah hosts the Arizona Wildcats at Rice-Eccles Stadium in Salt Lake City, Friday Oct. 12, 2018. Utah leads 28-0. Leah Hogsten | The Salt Lake Tribune Utes wide receiver Demari Simpkins (7) pulls down the touchdown pass as the University of Utah hosts the Arizona Wildcats at Rice-Eccles Stadium in Salt Lake City, Friday Oct. 12, 2018. Utah leads 28-0. Leah Hogsten | The Salt Lake Tribune Arizona Wildcats quarterback Jamarye Joiner (10) fumbles and recovers the ball as the University of Utah hosts the Arizona Wildcats at Rice-Eccles Stadium in Salt Lake City, Friday Oct. 12, 2018. Leah Hogsten | The Salt Lake Tribune Utes defensive end Maxs Tupai (92) and Utes linebacker Cody Barton (30) bring down Arizona Wildcats running back J.J. Taylor (21)as the University of Utah hosts the Arizona Wildcats at Rice-Eccles Stadium in Salt Lake City, Friday Oct. 12, 2018. Leah Hogsten | The Salt Lake Tribune Utes quarterback Tyler Huntley (1) with the touchdown as the University of Utah hosts the Arizona Wildcats at Rice-Eccles Stadium in Salt Lake City, Friday Oct. 12, 2018. 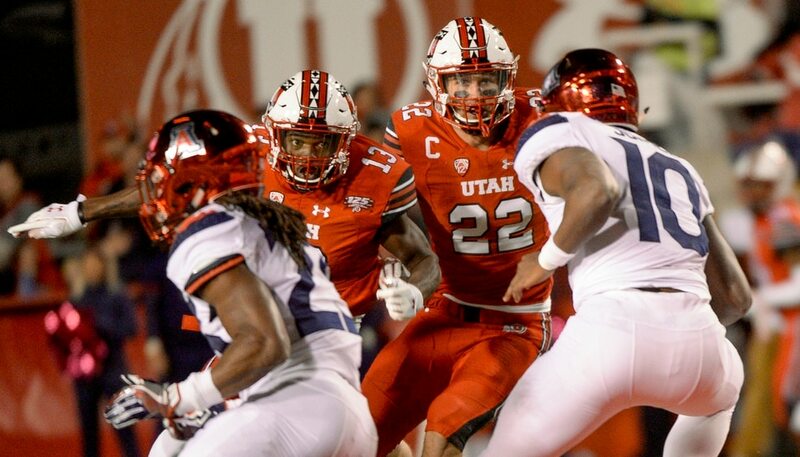 Utah leads 28-0.t Leah Hogsten | The Salt Lake Tribune Arizona Wildcats quarterback Jamarye Joiner (10) is sacked by Utes defensive end Bradlee Anae (6) as the University of Utah hosts the Arizona Wildcats at Rice-Eccles Stadium in Salt Lake City, Friday Oct. 12, 2018. Leah Hogsten | The Salt Lake Tribune Utes wide receiver Demari Simpkins (7) pulls down the touchdown pass as the University of Utah hosts the Arizona Wildcats at Rice-Eccles Stadium in Salt Lake City, Friday Oct. 12, 2018. Utah leads 28-0. 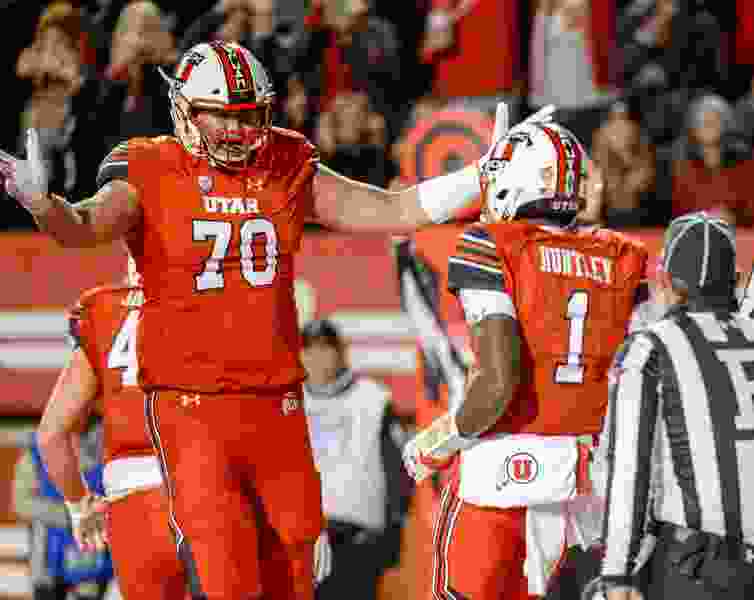 Leah Hogsten | The Salt Lake Tribune Utes offensive lineman Jackson Barton (70) celebrates Utes running back Zack Moss' (2) touchdown as the University of Utah hosts the Arizona Wildcats at Rice-Eccles Stadium in Salt Lake City, Friday Oct. 12, 2018. Leah Hogsten | The Salt Lake Tribune Utes defensive tackle John Penisini (52) celebrates with Utes defensive end Bradlee Anae (6) as the University of Utah hosts the Arizona Wildcats at Rice-Eccles Stadium in Salt Lake City, Friday Oct. 12, 2018. Leah Hogsten | The Salt Lake Tribune Utes quarterback Tyler Huntley (1) celebrates his touchdown with Utes offensive lineman Jackson Barton (70) as the University of Utah hosts the Arizona Wildcats at Rice-Eccles Stadium in Salt Lake City, Friday Oct. 12, 2018. Utah leads 28-0.t Leah Hogsten | The Salt Lake Tribune Utes defensive back Josh Nurse (14) and Utes linebacker Cody Barton (30) bring down Arizona Wildcats wide receiver Shun Brown (6) as the University of Utah hosts the Arizona Wildcats at Rice-Eccles Stadium in Salt Lake City, Friday Oct. 12, 2018. Utah leads 28-0. Leah Hogsten | The Salt Lake Tribune Utes defensive end Maxs Tupai (92) brings down Arizona Wildcats running back J.J. Taylor (21) as the University of Utah hosts the Arizona Wildcats at Rice-Eccles Stadium in Salt Lake City, Friday Oct. 12, 2018. Leah Hogsten | The Salt Lake Tribune Utes running back Zack Moss (2) with the touchdown as the University of Utah hosts the Arizona Wildcats at Rice-Eccles Stadium in Salt Lake City, Friday Oct. 12, 2018. Utah leads 28-0. Leah Hogsten | The Salt Lake Tribune Fans celebrate Utes wide receiver Demari Simpkins (7) touchdown catch as the University of Utah hosts the Arizona Wildcats at Rice-Eccles Stadium in Salt Lake City, Friday Oct. 12, 2018. Utah leads 28-0. Leah Hogsten | The Salt Lake Tribune A pass intended for Utes wide receiver Jaylen Dixon (25) is broken up by Arizona Wildcats cornerback Lorenzo Burns (2) as the University of Utah hosts the Arizona Wildcats at Rice-Eccles Stadium in Salt Lake City, Friday Oct. 12, 2018. Utah defeated Arizona 42-10. Leah Hogsten | The Salt Lake Tribune Arizona Wildcats head coach Kevin Sumlin talks with players during a timeout in the 4th quarter as the University of Utah hosts the Arizona Wildcats at Rice-Eccles Stadium in Salt Lake City, Friday Oct. 12, 2018. Utah defeated Arizona 42-10. Leah Hogsten | The Salt Lake Tribune Utes quarterback Jason Shelley (15) laughs after he was caught in the pocket by Arizona Wildcats cornerback Lorenzo Burns (2) and linebacker Anthony Pandy (26) as the University of Utah hosts the Arizona Wildcats at Rice-Eccles Stadium in Salt Lake City, Friday Oct. 12, 2018. Utah defeated Arizona 42-10. Leah Hogsten | The Salt Lake Tribune Utes running back Zack Moss (2) is brought down by Arizona Wildcats linebacker Colin Schooler (7) as the University of Utah hosts the Arizona Wildcats at Rice-Eccles Stadium in Salt Lake City, Friday Oct. 12, 2018. Utah defeated Arizona 42-10. Leah Hogsten | The Salt Lake Tribune Utes defensive back Julian Blackmon (23) is pulled down by Arizona Wildcats (16) as the University of Utah hosts the Arizona Wildcats at Rice-Eccles Stadium in Salt Lake City, Friday Oct. 12, 2018. Utah defeated Arizona 42-10. Leah Hogsten | The Salt Lake Tribune Utes head coach Kyle Whittingham talks with Arizona Wildcats quarterback Rhett Rodriguez (4) after the game as the University of Utah hosts the Arizona Wildcats at Rice-Eccles Stadium in Salt Lake City, Friday Oct. 12, 2018. Utah defeated Arizona 42-10. Leah Hogsten | The Salt Lake Tribune Arizona Wildcats wide receiver Cedric Peterson (18) slips past Utes defensive back Josh Nurse (14) on his touchdown run as the University of Utah hosts the Arizona Wildcats at Rice-Eccles Stadium in Salt Lake City, Friday Oct. 12, 2018. Utah defeated Arizona 42-10. Leah Hogsten | The Salt Lake Tribune Utah defeated Arizona 42-10, at Rice-Eccles Stadium in Salt Lake City, Friday Oct. 12, 2018. Leah Hogsten | The Salt Lake Tribune Utes running back Armand Shyne (6) slips past Arizona defense on his 53yard run into the end zone as the University of Utah hosts the Arizona Wildcats at Rice-Eccles Stadium in Salt Lake City, Friday Oct. 12, 2018. Utah defeated Arizona 42-10. USC is 3-1 in conference play. A victory Saturday would give the Trojans a two-game lead over Utah. If the Utes win, they’ll be tied with USC and own the tiebreaker. Updated after Saturday’s results, ESPN’s Football Power Index slightly downgraded Utah’s season forecast from 8.6 wins to 8.5 wins. The Utes have reoriented themselves to the running game offensively and pride themselves on stopping the run. Yet the outcome vs. USC could be determined through the air. USC freshman JT Daniels overcame a slow start against Colorado by passing for 272 yards and three touchdowns. He’ll face a Ute secondary that has allowed significant yardage in the past three games and hurt itself with penalties. USC’s defense held previously unbeaten Colorado to 265 total yards. Utah quarterback Tyler Huntley, meanwhile, has produced “back-to-back outstanding performances,” coach Kyle Whittingham said. In wins over Stanford and Arizona, Huntley went 31 of 40 for 400 yards and three touchdowns, with one interception. Huntley is 10-6 in two seasons as a starting quarterback, including 4-6 in Pac-12 play. He gets credit for a 2017 win at Arizona, although he was injured early in that game. Huntley then missed losses to Stanford and USC last October. His signature win is a recent 40-21 victory at then-No. 14 Stanford, clinched by his 57-yard touchdown pass to Samson Nacua after he escaped the rush. Beating the Trojans would top that achievement, just because of the game's value in the South race. 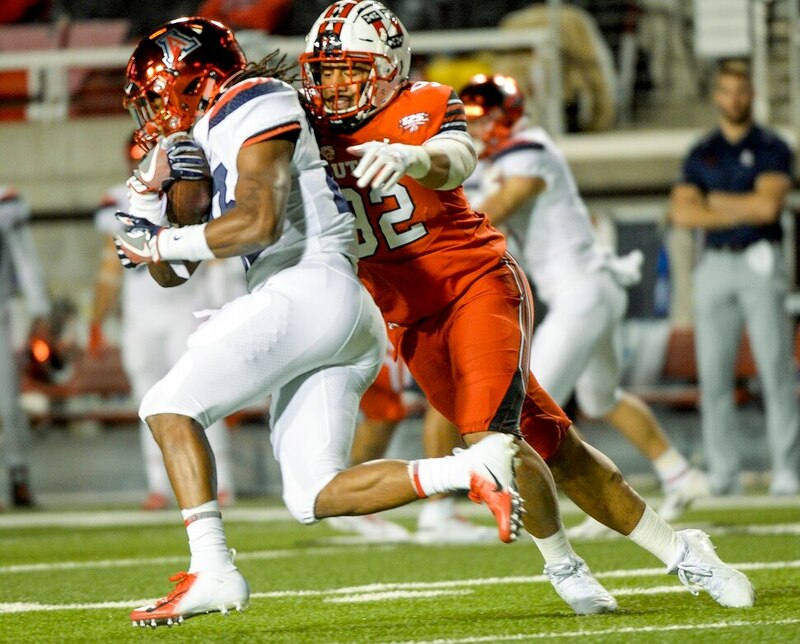 Zack Moss' rushing success with a total of 228 yards on 35 carries in the past two games has opened up Utah’s passing game, and Huntley and his receivers have done their best work of the season. More of that efficiency will be needed against USC.